Get started with your domain name today From $12.99! 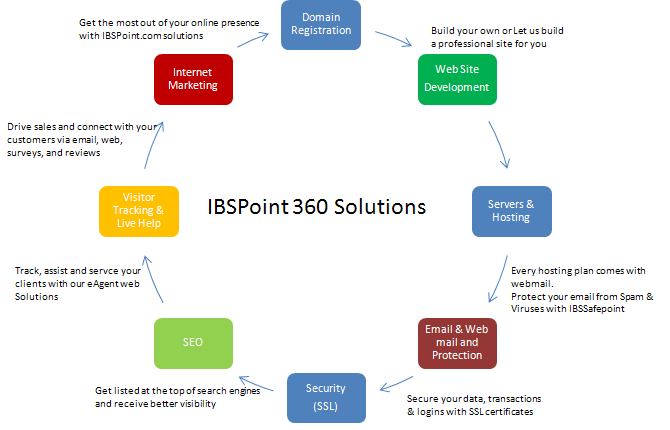 IBSPoint.com offers a “no questions asked” 30 days money back guarantee with all our hosting plans. Our cancellation policy is very simple – if you cancel your hosting account within the first 30 days of it’s setup, we will provide you with a refund of what you paid. The refund will exclude any setup fees that were charged when you signed up and any domain registration fees that you paid as we incur a cost for these. But you do get to keep your domain name. Each of the various components in our solution portfolio is branded as a fully functional independent service. Click on a service on the left to find out more information on the service and the unique benefits IBSPoint.com offers to our customers. True 128bit – 256bit strong encryption. Visitors see the green bar and enhanced trust means enhanced sales. We offer four types of SSL Certificates each designed for specific customer requirements. Choose which GlobalSign SSL Certificate is most appropriate for your needs. All our Certificates offer the strongest security available through any SSL provider! Free SGC encryption (technology to turn weak browsers into strong browsers – our competition charge you for this! IBSPoint.com offers a full range of hosted services, giving you access to secure, reliable, full-featured messaging and collaboration solutions that don’t require the investment and ongoing management resources to deploy them on your own. Increase your business’s efficiency with hosted Microsoft Exchange 2010. Exchange 2010 includes many new features to help your employees boost their productivity by offering a consistent inbox, calendaring and contacts experience across the PC, browser and mobile phone. 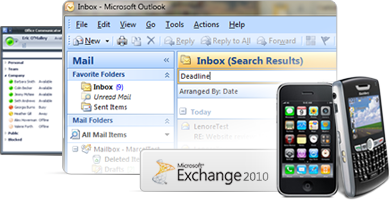 Exchange 2010 offers an enhanced Outlook Web App that can be accessed from Firefox and Safari browsers, in addition to Internet Explorer. Plus, enhancements to mobile access allow you to extend the productivity benefits of Exchange to workers even when they’re away from their PC. Hosted Windows SharePoint is a powerful platform for building shared document repositories, corporate Intranets and project specifics website. There is no hardware or software to manage, and accessible anytime, anywhere through a web browser. Windows SharePoint is designed to increase productivity. Businesses of any size can leverage SharePoint to create document storehouses to increase collaboration within a company and between a company and its partners, vendors and customers. With Windows SharePoint you can share documents, calendars, contacts, links, ideas and more, without wasting time exchanging inefficient emails. Hosted mobile email solutions let you easily and quickly enable secure, robust business-grade mobile email for BlackBerry® and ActiveSync-enable PDAs and smartphones. Using “push” technology, mobile email solutions give you all of the features of your PC- or browser-based email right from your mobile phone. No matter your mobile device, platform or wireless carrier preference, our solutions will help you stay connected to colleagues, partners, and customers so you can keep your business moving no matter where you are. MessageMirror provides your business with a simple, powerful archiving solution for storing, retrieving and searching all the emails sent and received through your hosted Exchange service. A number of additional features can be added to your Hosted Exchange service to increase your productivity and security. a full featured desktop client where you can manage email, calendars, contacts and tasks. add HTML or text disclaimers to your messages to communicate a company-wide email policy. retain your email and electronic records for compliance with HIPAA, Sarbanes-Oxley and other regulations. sync username/password and other user attributes between your on-premise and hosted applications. IBSPoint Agent Services ..Coming Soon. we will focus on your servers! We are a leader in managed hosting solutions with world-class data centers that give you secure, scalable, reliable and superior IT infrastructure solutions. Whether your enterprise needs dedicated server solutions, Virtual dedicated servers or any type of managed hosting solution, you can count on IBSPoint superiority. Learn More about our enterprise solutions now! Learn More and register your domains now!